The tram ride to the top of Rendezvous Mountain is a Jackson Hole, Wyoming, must do. Locals call it “Big Red”; you’ll find its photo on almost every postcard. In the winter it’s a warm lift to the top of the mountain. In the summer, it’s the ultimate sightseeing ride. You climb over 4,000 vertical feet in only 15 minutes. As you fly up the hillside the 360 degree views of Jackson Hole, Snake River Valley, Grand Teton National Park and the summit of The Grand are breathtaking. The day we rode to the top it was 75 degrees at the base, we were wearing shorts and t-shirts. 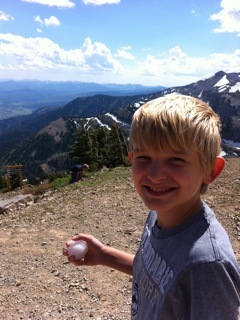 When we exited the tram at over 10,000 feet in the air my son made snowballs. There’s not much at the top except for mind blowing views. There’s a little restaurant the sells chocolate covered waffles and souvenirs. The wind is shocking, as is the cold. Be sure to pack a sweatshirt, money for a waffle and your camera. The tram runs every 15 minutes, you can do the whole trip in an hour, but you can’t say you’ve been to Jackson Hole and didn’t ride Big Red. We received complimentary tickets from the Jackson Hole Resort. 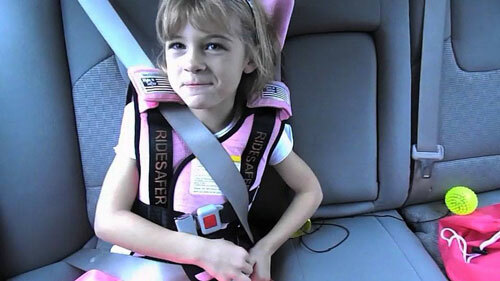 Next Post: What if My License is Stolen While Traveling?